The calm of the shoreline is interrupted by a whistling noise. 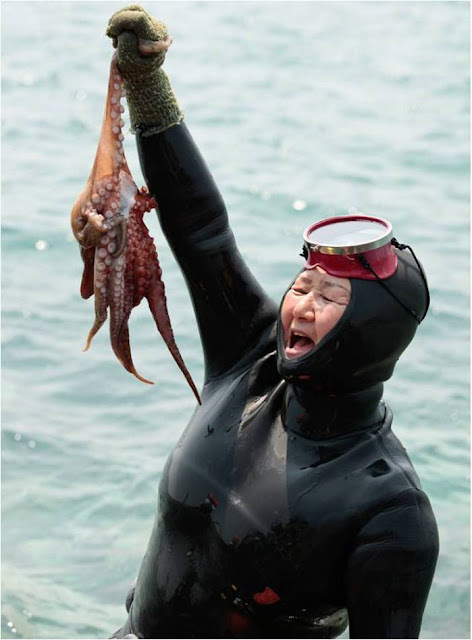 Then, a strange, sleek shape breaks the surface of the Korean Strait, clasping its quarry. Yet there is no need to call David Attenborough just yet – this is no strange new species of seal. 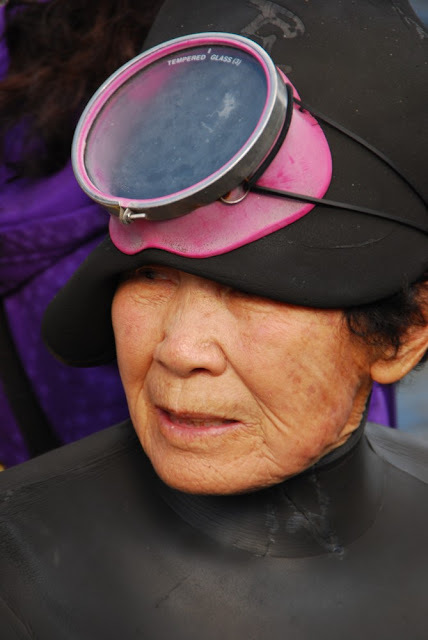 In fact, it’s an elderly lady; one of the indomitable diving grandmas of Jeju Island. 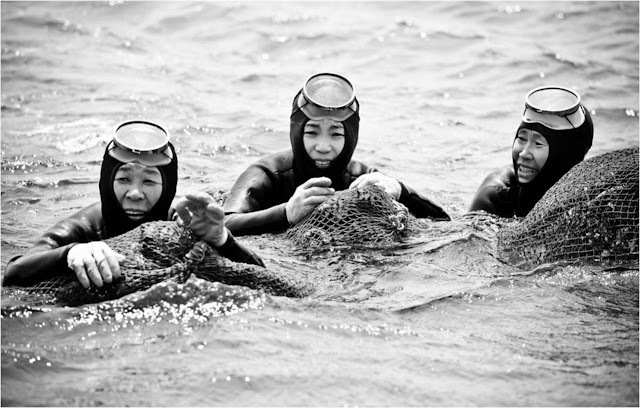 They call themselves haenyo (pronounced hen-yuh), which literally means sea women and the whistling sound they made preceding their exit from the depths is called sumbisori. They are representative of a centuries old tradition, one which transformed their island in to a functioning matriarchy but a way of life which today is in danger of disappearing forever. 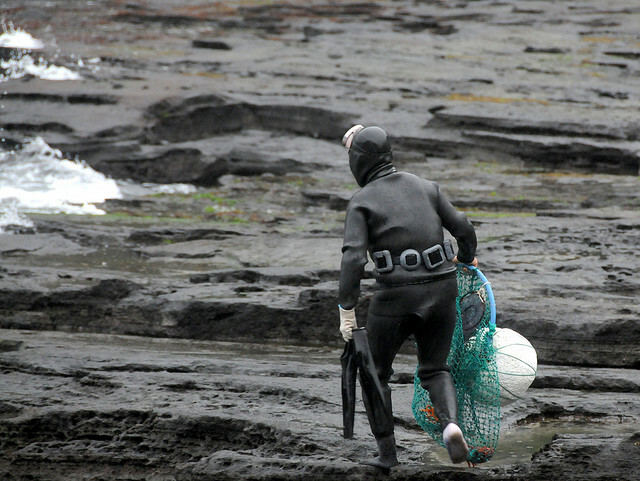 The island of Jeju, 53 miles south of mainland Korea, lies at the watery crossroads of the Yellow and East China Seas. 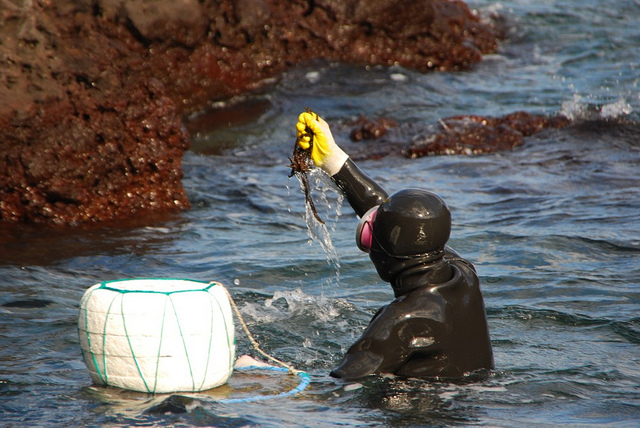 Diving for conch, octopus, urchin, and abalone had always taken place there but due to large taxes was never very profitable – something men would take up if there was no alternative. That was until a canny group of women in the 18th century realized that women did not, unlike their men folk, have to pay taxes. A loophole was about to become a living. 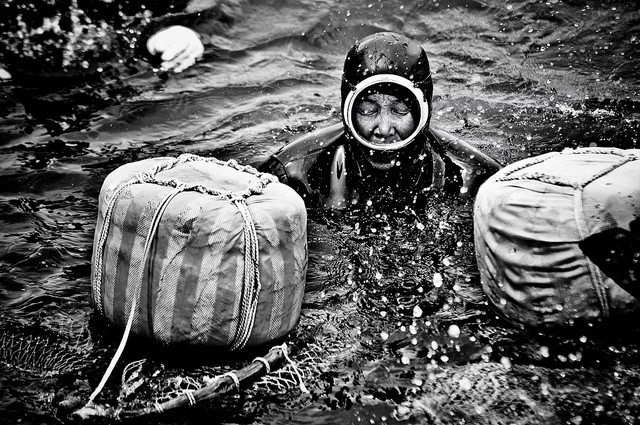 What was a subsistence income became a lucrative revenue, once the gender of the divers was swapped and no tax had to be paid. 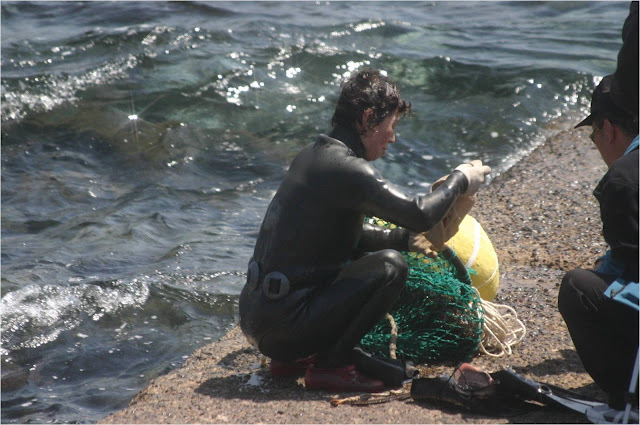 From then on it was the women who scoured the ocean and its floor – and it was the women who became the main breadwinners of the household. 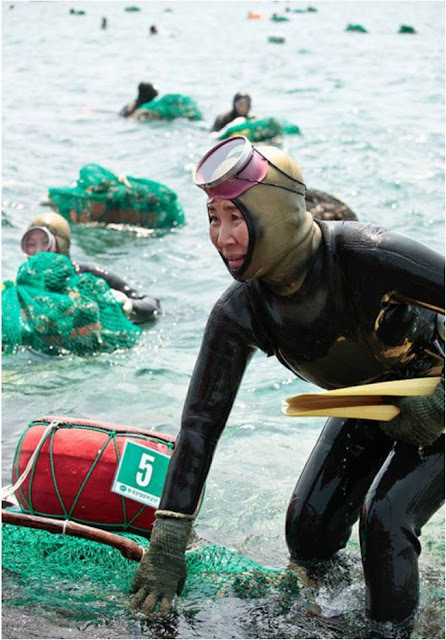 Once the burgeoning women only activity had taken hold of the island’s economy, with tens of thousands of female divers creating an industry then a matriarchy blossomed. 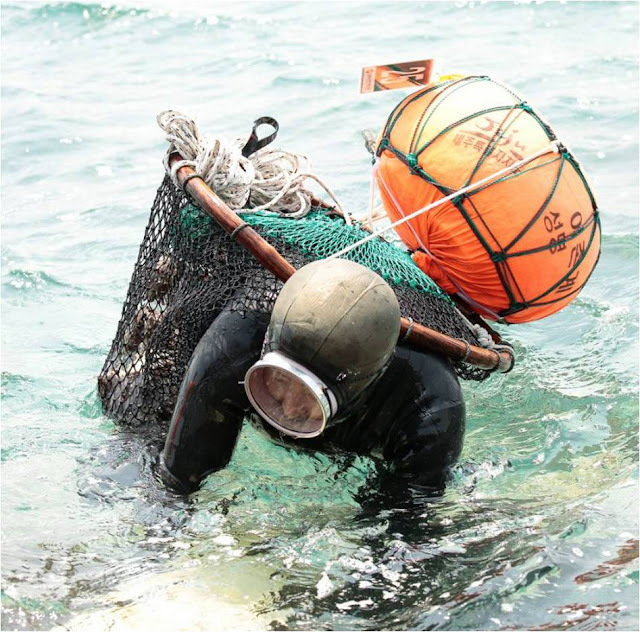 The haenyo (sometimes spelled haenyeo) do not use oxygen tanks, which would only weigh them down and make their difficult task even harder. 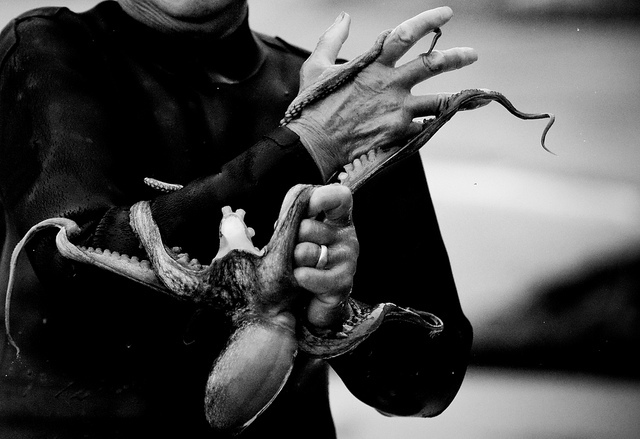 Their black wet suits and goggles are all they need to descend to the sea floor to collect their bounty. The skills they possess serve them well now – and did so too under the Japanese occupation of the Second World War. 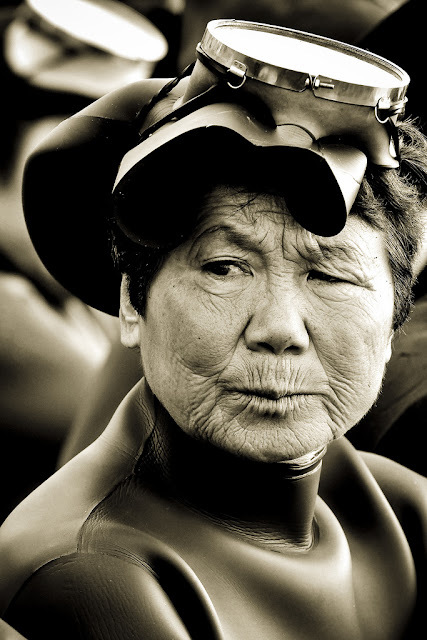 Many haenyo became heroines of the Korean resistance movement. It is a lifestyle (and income) which is not easy to give up. 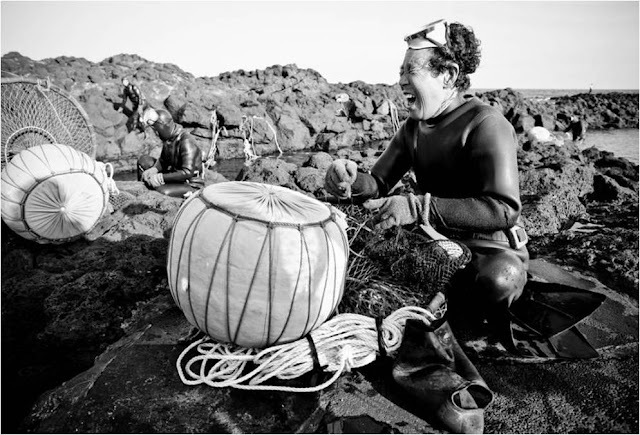 So the women, many now widows but still sturdy and unwaveringly self-determining, continue to visit the shoreline and dive for the riches of the sea which often lie over 60 feet below the surface. 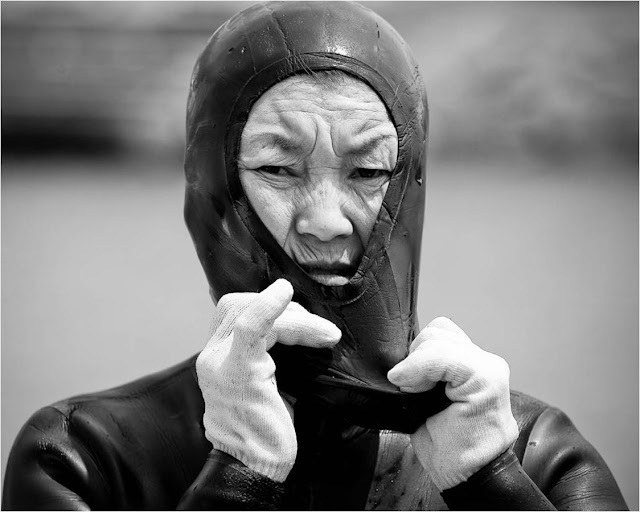 These old ladies are fit – they can hold their breath for up to two minutes and must be vigilant for the dangers the Korean Strait holds – stinging jellyfish and sharks. 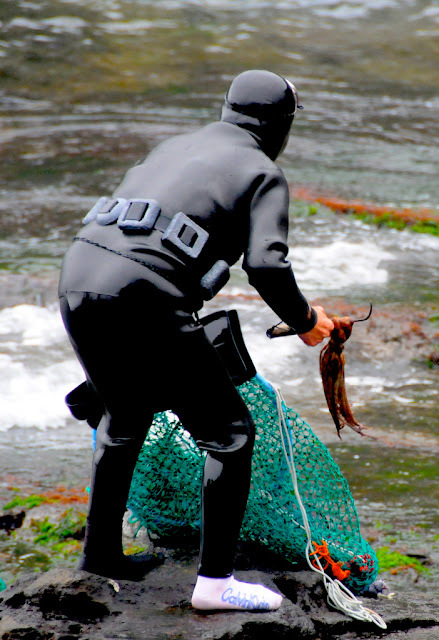 Yet their way of life is under threat – and ironically it is their very success that has led to this. 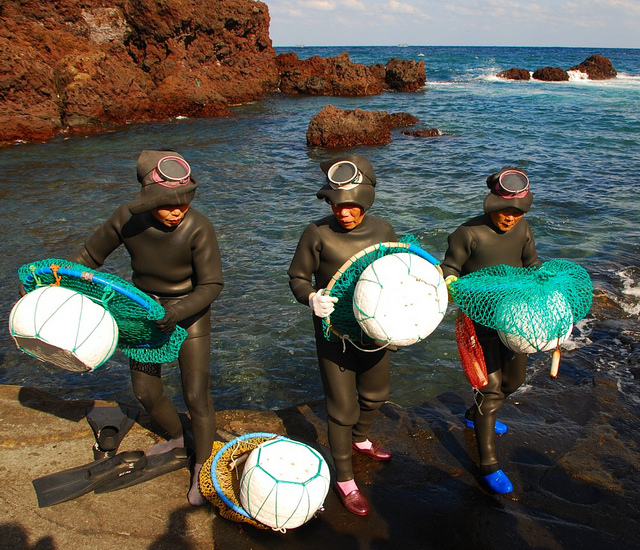 In the 1970s the Japanese market for abalone and conch expanded and demand led to the haenyo becoming wealthier than they ever had been before. They were able to send their daughters to college on mainland Korea. Yet this expansion of academic horizons has also led to a disinclination of the daughters to dive. The figures are bleak. 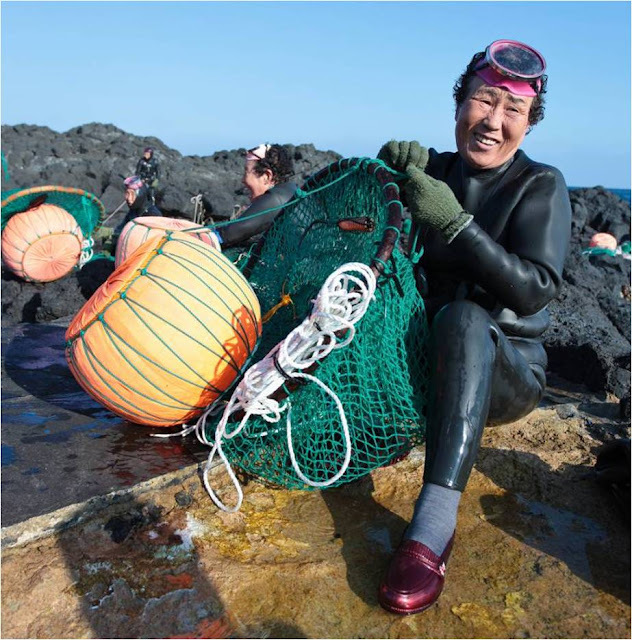 Half a century ago there were over thirty thousand haenyo on the island. 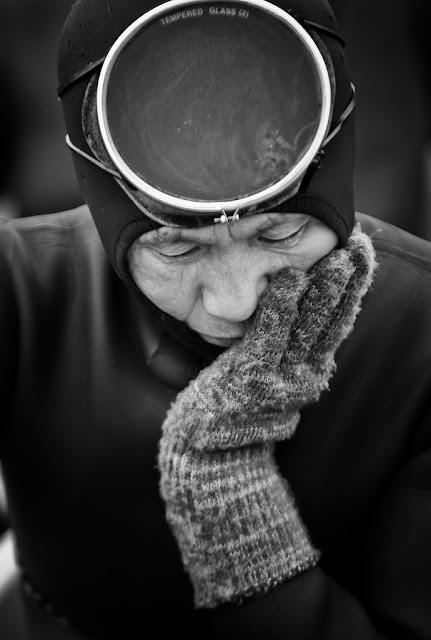 Now, the number of registered divers is a little over five thousand and many of these are aged over sixty. As tourism from the mainland and abroad took off many of the next generation decided to opt for drier, less physically demanding careers. Tourism has also meant a resurgence in the employment prospects of the local men whose incomes are now on a par with or greater than that of the divers. It is believed that the haenyo culture could disappear as a viable economic force on the island within a generation or two and that gender roles may well revert to what they once were. Looking at the women in these pictures, however, it is difficult to imagine them accepting anything but complete equality. Yet one does not have to bow to what seems inevitable. 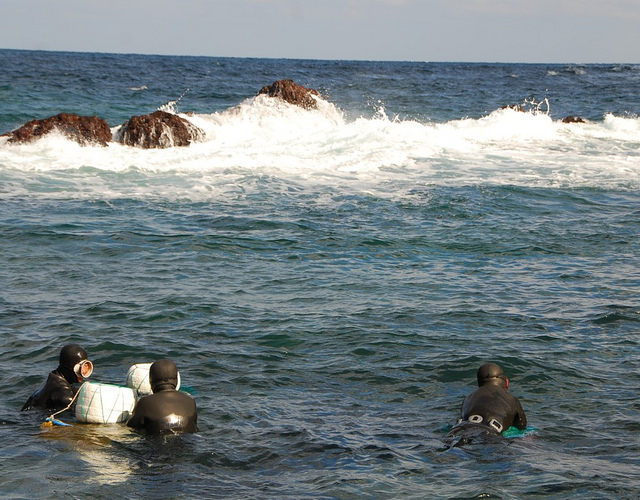 Each day the remaining haenyo gather at the shore line. 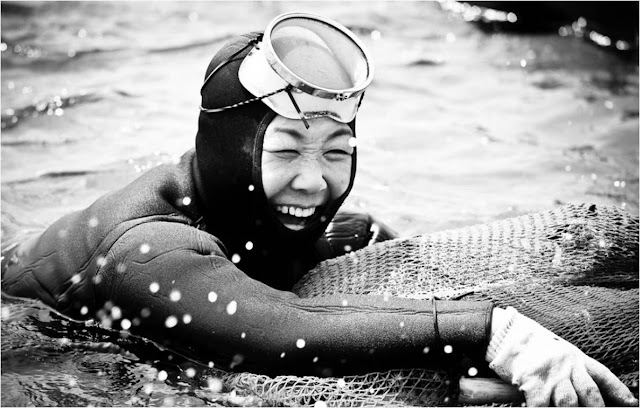 They sing their songs of love, loss and lament as they ready themselves, don their wet suits and dive once more as they have always done as did their mothers and grandmothers. The tradition may pass but for these ladies, this is the time of their lives. Kuriositas would like to thank all of the Flickr photographers featured here. We would particularly like to thank DMac 4D MkII for allowing us to show you his copyrighted photographs. Please take a look at his superb Flickr Photostream. 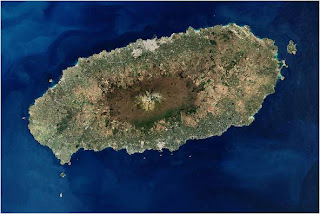 You can see the other photographers’ work by clicking on the photographs too.Thanks to Wikimedia, too, for the aerial shot of Jeju Island.